When I lived in Puerto Rico as a young girl I loved to visit my grandmother because she would spend hours teaching me how to cook authentic recipes that had been handed down through generations. Our homes were separated by a long, winding road through the hills and mountains called “El Camino.” When I asked my mother if I could go to grandma’s house, she would say “go ahead and take El Camino.” This road separated us, but at the same time, united us. Still to this day, whenever I am cooking, I fondly remember my visits with her and walking along that winding road to see her, thus the reason a graphic depiction of that road is included in our logo. My grandmother cooked with love and now I am happy and proud to share that love with you. All of El Camino Foods’ dishes are made with the finest authentic ingredients and seasonings so you can fully experience the rich, full flavor of traditional Puerto Rican cuisine. Elizabeth and David Silva, owners of El Camino Foods, LLC worked in the corporate world for many years, but because they wanted to spend more time together and with their family – after a lot of soul searching, they decided to follow Elizabeth’s passion for traditional and authentic Puerto Rican cuisine and formed El Camino Foods to share Elizabeth’s family recipes throughout southern New Hampshire and Massachusetts. Because of their participation in many local farmers’ markets and festivals, the Silvas have managed to create quite a loyal following. They are best known for their famous empanadas and authentic Puerto Rican rice dishes which are enjoyed by thousands of happy customers every week. El Camino Foods catering services, with an expanded menu has received many accolades and allowed customers to experience a wider variety of their Puerto Rican specialties. Elizabeth has a bachelor’s degree in Accounting from Northeastern University and received her Master in Information Technology from Southern New Hampshire University. For ten years she has worked in the areas of problem-solving and solution-finding as a Financial Systems Analyst. Her clients were day-to-day business users of technology who sought Elizabeth’s expertise in the area of financial reporting systems. Elizabeth’ nationality is Puerto Rican and she’s fluent in Spanish. 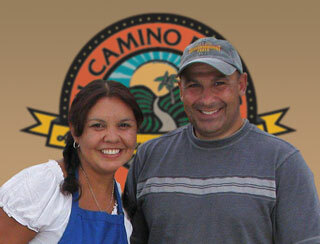 Being of Hispanic descent and speaking Spanish is a huge contributing factor for El Camino’s presence and success. David has a bachelor’s degree in Accounting from Merrimack College. Following school, David went to work for one of the largest ophthalmology groups in the Merrimack Valley area. After ten years with Tallman Eye, David had risen up to Comptroller level. It is his time at Tallman Eye Associates that provided David with valuable bookkeeping, accounting and financial insight and experience. He also is an Information Technology consultant.